The process for the development of arteriosclerosis, as put forward by Duguid, is that repetitive stress to the arterial wall produces damage which is patched by a microthrombus. 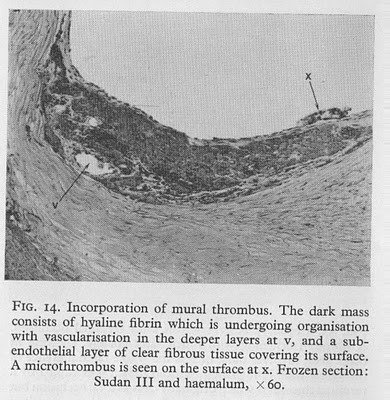 This then covers with epithelium and organises in to what is essentially a scar used to strengthen the arterial wall exactly where this is needed. 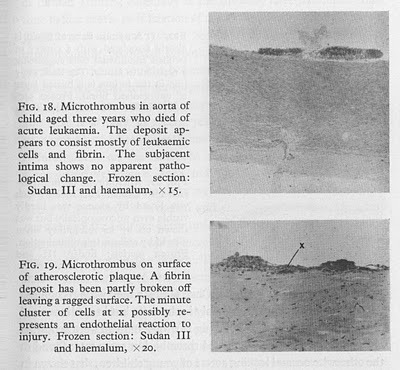 Here are a few micropgraphs of Duguid's showing microthrombus on the arterial wall, again taken from his monograph The Dynamics of Arteriosclerosis. These require frozen sections, formalin fixing and paraffin wax embedding will tend to lose microthrombi or convert them to "gunk" in the lumen of the artery. Now the processing of thrombus to collagen is just that, a process. It doesn't simply "happen". So the very obvious question is what happens when the process goes wrong? Unhappily there are a number of mucopolysaccharide storage diseases which result from the inability to degrade proteoglycans. 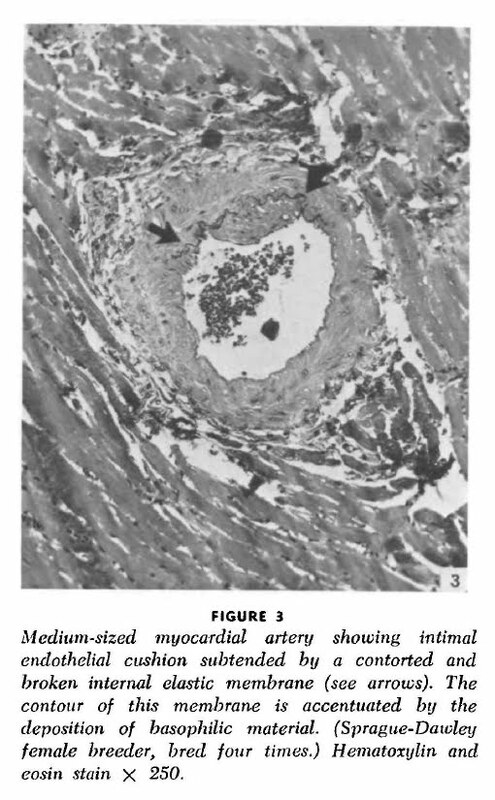 If you cannot degrade proteoglycans but continue to produce the microthrombi, as suggested by Duguid, you might expect some accumulation of mucopolysaccharide in the walls of stressed arteries. 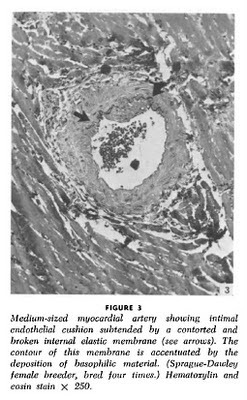 Here is a nice picture (part B) from this paper of the coronary artery of a young child who died of complications of this genetic defect. You might accept that there is some narrowing of the lumen. There are a number of factors under our control which seem to influence our ability to obstruct our arteries with the sequelae of microthrombi, some of which I'll get to eventually. I happened on this fascinating acount of sudden death in young fit adults. This condition is usually associated with abnormal cardiac rhythm, particularly sudden onset ventricular fibrillation. Obviously making your salad dressing with sunflower oil is probably your best risk factor for throwing serious cardiac rhythm abnormalities, but developing an ischaemic atrioventricular node seems to be an excellent trigger for local hypoxia to start the fibrillation. 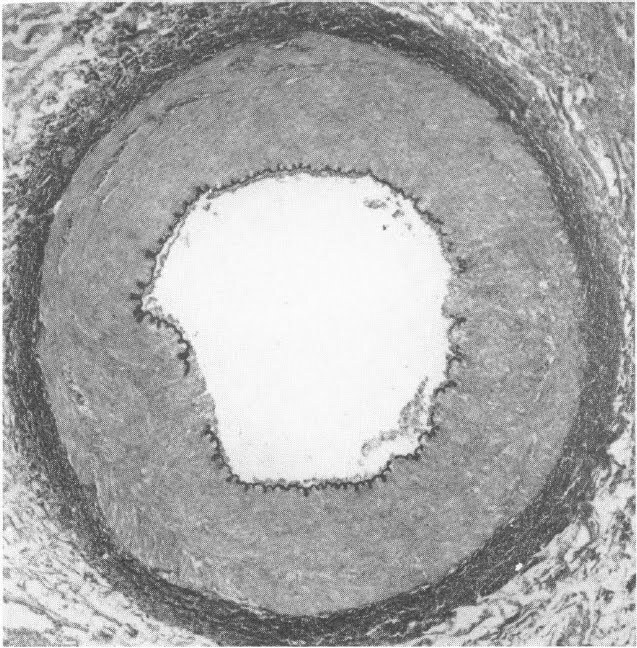 Stenosis of the micro artery to the AV node appears to be a feature of sudden death in young males. I don't have access to the full text so I don't know what the histology pictures look like. I'm a bit suspicious that the changes will turn out to be merely those which any numpty with internet access can down load from Pubmed, in papers going back 60 years. It really brings home the utter ignorance of cardiologists working under the cholesterol paradigm. BTW, does anyone have access to the pictures? It would be nice to have them here... Assuming they look as I think they do! EDIT: The pics are here, thanks Anna. Ok, another picture show I composed off line. I'm home next week but there is a lot to do other than use Tinternet. This one is from Wexler's 1964 paper "Spontaneous Coronary Arteriosclerosis in Repeatedly Bred Male and Female Rats". BTW anyone reading it carefully might be tempted to add celibacy to any program of heart health protection. Personally I suspect this is not necessary. Too late now anyway! Let's look at old rats. If you feed rats a 5% fat diet, with the fat as "heart healthy" corn oil, you can actually make Dean Ornish look like a gourmand. These rats are old. They are ex breeding rats. They do not have cholesterol poisoning and their diet has been specifically chosen, under a mistaken paradigm, to maximise health, longevity and breeding success. If you eliminate the impatience of a cardiologist and wait for the rats to age, what do their coronary arteries look like? Bear in mind that rats are supposed to be resistant to arteriosclerosis (But that is probably only at the age a cardiologist can be persuaded to wait until). Notice the contorted internal elastic membrane between the arrows. The elastic lamina is thickened with mucopolysaccharide. There is a neat intimal cushion overlying this area. There is, err, no cholesterol. Oddly enough cholesterol does not seem to rupture elastin fibres! Like Lp(a), the LDL particle would have to carry that flick knife... Which it doesn't. 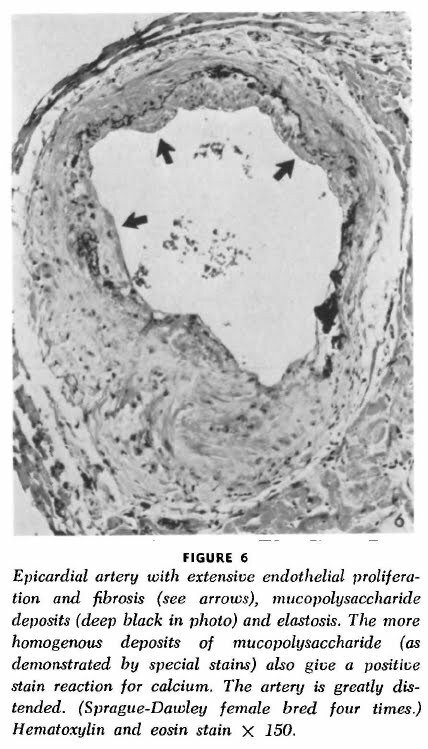 Next is an epicardial artery. 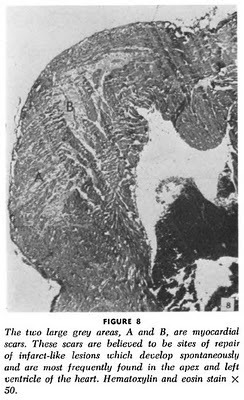 These arteries, especially the left anterior, are particularly interesting because they are not supported by surrounding myocardial muscle so the artery wall is particularly pressure challenged. 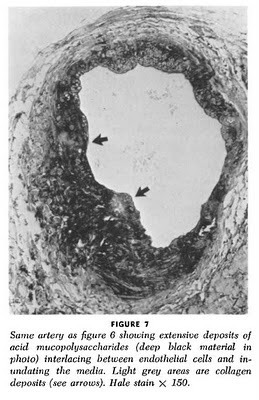 Apart from the appearance of multiple endothelial cushions overlying shredded elastin there are also dark black areas of "gunk" on the right hand arterial lining area of the artery. These stain positive for calcium. There is, err, no cholesterol. Just for fun the authors took another section from the same tissue block as was used for figure 6 and stained it for mucopolysaccharide. The section is nearly identical. This, here in figure 7, clearly shows the extent of the abnormal intima. No cholesterol. Strange that. Do these rats get ischaemic disease? You bet! The myocardial necrosis lesions, which are common, do not appear to be directly related to the diseased large arteries. They certainly make me think of Kurt's posts here and here on myocardial damage in marathon runners. The mice don't run, but they do carb load each and every meal. They have no choice. Carbs or starve. To me this suggests that it might actually be the diet used by marathon runners which kills them, rather than the running per se. Though the chronic cardio might well do a great deal of damage to the elastic intima due to the stretching needed to accommodate the high flow generated. But possibly they just eat rather more crap than normal human beings do. Just an idea. It also begs the question of why cardiologist keep thinking that the cholesterol fed rat (or the equally poisoned Syrian hamster) has anything to do with human arteriosclerosis. In the mean time folks might enjoy this from Dr Volek. It didn't seem to make headline news, can't imagine why. Personally I would be loathe to take dietary advice from an AHA cardiologist who stands to benefit from my having a heart attack. They are unlikely to be completely honest.